Whose Lunch Is It, Yours Or Mine? I took this photo at lunch today while I was being pestered by you-know-who, blind Widget. She is usually not the first to the dining table -- she generally saunters over about midway through our meal. The first-responders, as we call them, are the Dachshunds, who are already waiting for Alayne and me even before we sit down. Maybe it's because Widget realizes she's late to the table, or maybe it's just because of her brassy and bold Beagle personality, but she is very insistent and tenacious about getting what she thinks is her rightful share of our food. You can see from the photo what she does ... she stands up on her little hind legs, front paws on my lap, staring intently at me as if to say, "Well?" If I cave and give her a morsel, she'll drop back down to the floor, eat it in 3 seconds, and rise up again. If I gently push her off me with a "No" followed by one of the various lines that never seem to work ("Widget, there's nothing left" ... "Widget, I don't have enough for myself" ... "Widget, you wouldn't like it anyway"), she'll just keep popping up. If I finally ignore her -- and that face is almost impossible to ignore -- she'll simply walk underneath the table and do the same thing to Alayne. In fact, the only brush-off line that seems to work is, "Widget, go pester your Mom," and off she'll go. If It Looks Different, Well, It Is Different! 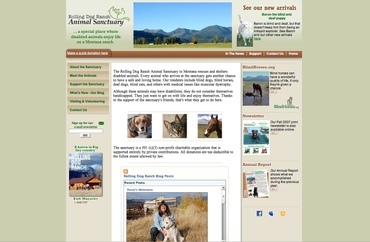 This weekend we rolled out a redesign of our main sanctuary Web site. Among other things, it's wider, has a simpler interface, improved navigation, and a "fresher" look. As usual, the credit goes to our fabulous graphic and Web designer, Terrel Armstrong, who does all this work for us pro bono. Terrel also designed our new BlindAppaloosas.org Web site. In the redesigned site, we added a new feature called a WidgetBox that publishes a live feed of our blog right on the home page, photos included. 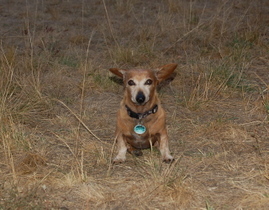 The WidgetBox is displayed in the center of the home page under the three thumbnail photos of Widget (who thinks the WidgetBox was named for her), Wobbles and Lena. We tested this feature on both PCs and Macs using a variety of browsers (Internet Explorer, Firefox and Safari) and different versions of those browsers. We think it should work on virtually all platforms, but if you see white space instead of the blog feed, please send me an email and tell me what kind of computer you're using and which browser and what version you have installed. As with any Web site redesign, there's usually something odd that sneaked through, so if you see anything that doesn't look right, please let me know. We also posted on the site this weekend our latest quarterly print newsletter, the Fall 2007 issue, and individual Web pages on some of our recent arrivals. 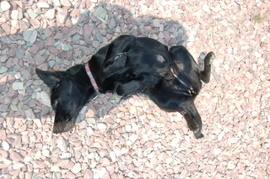 (Others, like Blanca and Kasha, will appear in our Winter 2007 newsletter and also on the Web site at that time.) The Fall 2007 newsletter went in the mail last week and should be appearing in mailboxes over the next 10 days or so. 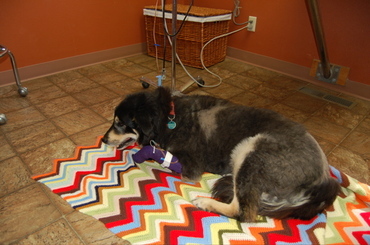 Alayne brought blind Dusty home from the vet clinic in Helena today after surgery for melanoma. During her recent visit to the ranch for our annual health day, our small animal vet, Dr. Brenda Culver, had noticed a growth on Dusty's lip during the exam. This took a sharp eye, because it wasn't much of a growth and in fact, it looked so much like part of his lip that we hadn't even noticed. It was an excellent call, because it turned out to be melanoma. Brenda successfully removed it and the pathologist's report said she had good, clean margins all the way around the excised tumor, so the entire cancer should be gone. After a week in the hospital, Dusty was glad to be home! In the background trying to get their photos taken are Patches, the Paint mare on the left, and Lilah the white mare on the right. 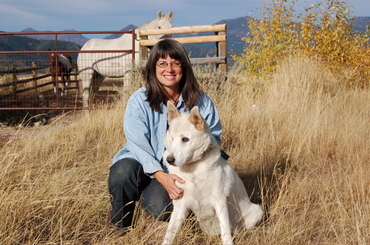 Patches came to us several years ago from an animal cruelty case in the Bitterroot Valley of Montana. The court turned Patches over to us for safekeeping while the case went to trial, and when the owner was finally convicted and the case settled -- nearly a year later -- the judge awarded us custody. (We weren't involved in the case at all until the court asked us to pick up Patches.) She can't be ridden but is otherwise in good health. Lilah is one of the non-blind "blind" horses we agreed to take, only to find out they're not blind. <sigh> We learned she actually only has congenital stationary night blindness, so she has trouble seeing at night but during the day she's the boss horse in the sighted herd. (Well, she's the boss of everybody except the Belgians!) Neither one of these two girls is listed on our Web site because we don't consider them disabled! I realize that the headline sounds like the ingredients for some kind of odd fusion cuisine, but those are the names of the horses I took into the vet hospital in Missoula today. Each had something totally different. 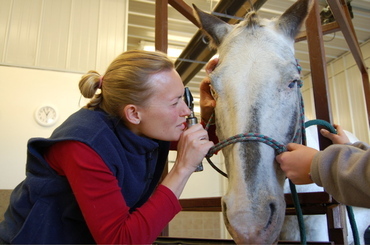 In the photo above, our equine vet, Dr. Erin Taylor, is examining Cactus Jack's eye. We have been treating this eye for several weeks now. For a while the eye would seem to return to normal, then Cactus would begin squinting and tearing again. You may recall that during a recent trip to the ranch, Erin had done a pressure check and eye exam because this same eye seemed painful. But progress was fleeting, and we decided it was time to have Erin look at it again. Today it became clear that he had a deep ulcer in the bottom of the eye that wasn't responding to treatment. We decided to remove the eye, and Erin will do the surgery tomorrow. She is going to insert a prosthetic device to fill in the eye socket to keep it from sinking in and getting the concave look. The device is called an equine conforming intraorbital implant and it looks like this. We routinely use implants on our dogs when we do eye removals, but this is the first time on a horse. The dog implants look more like black or brown marbles. Erin is a board-certified veterinary surgeon -- this means she has three years more training than a regular vet, and although her specialty is large animal surgery, she's becoming quite the ophthalmologist, too! 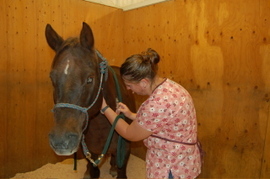 Next up was Honey, our blind Quarter Horse mare who is -- let us be clear -- no honey when she is in heat. She gets very crabby and in the past year has begun getting very kicky when she cycles. Normally she is a very sweet horse, but when goes into heat, she becomes a ... well, let's just say it rhymes with d-i-t-c-h. One thing we will not tolerate is a horse who kicks. So what do you do with a mare like this? You get her spayed! Yes, just like a dog or cat -- although the procedure is a bit more complicated. Spaying is not always a fool-proof method for ensuring an 'attitude adjustment' in a mare, but it usually helps. In this photo Erin's vet tech Julia N. is drawing blood from Honey. 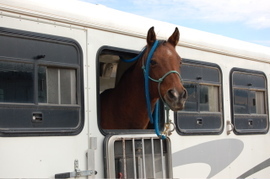 Finally, there was Blueberry, shown here being a goofball in the trailer while waiting her turn. Blueberry is our personal horse that we adopted several years ago as a riding horse for Alayne. She's 24 years old but acts like a 12-year old (Blueberry, not Alayne). A former dressage star in her day, she still has the graceful moves of an equine ballerina. But by the end of this summer she began to look like she has Cushing's -- long hair coat, a pot-belly, plenty of flesh on her yet her ribs are noticeable. So it was time for a blood test to find out if she does, in fact, have Cushing's. Results will take a few days. As for the names ... well, Honey and Blueberry were already named that when they came to us. Alayne gave Cactus Jack his name, and although I never quite figured out why, I suspect it had something to do with the latest Louis L'Amour western she read. Honey should have been named Sybil for her multiple personalities, and Blueberry should have been named Bayberry, since she's a beautiful bay. But no one asked me. We had a big rainstorm roll in this past weekend, and as is often the case, the wind arrived before the rain. 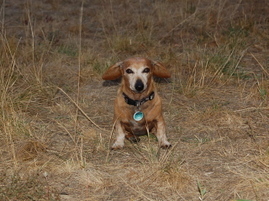 I was walking back from closing the windows in the cat house when I saw Bailey, our Doxie with the bad back, looking like he was about to go airborne. I went to my office to get the camera. Bailey was sitting facing directly into the wind, which was coming from the southwest. He was perched between the corners of two animal cottages, which magnified the wind and turned his spot into a bit of a wind tunnel. 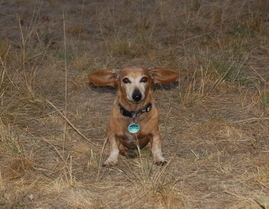 I realized watching his ears go up and down with the varying wind speeds that this Dachshund could be a perfect wind meter, so I kept shooting photos. For instance, his ears at this angle represent a wind speed of about 5 miles per hour. In this one, the wind is really picking up, and now we're probably at 10 mph. Bailey has to be careful because if we have a wind vortex come through sideways at this speed, it could set his ears to spinning and he could go straight up like a small helicopter. I liked this shot the most, so that's why I used it as the lead photo at the top of the post. And at this point the wind is howling. Here Bailey is at max wind speed, now about 15 mph. There's a certain resemblance to a slant-wing jet aircraft, say an F-14 Tomcat, preparing to take off. I'm not sure what would happen to those ears above 15 mph, since I didn't stick around long enough to find out. The rain was starting to move in so I scooped up Bailey to bring him inside. But I imagine at 20 mph the ears are going to go straight back and wrap around his little head, with the ear tips touching. I'll guess we'll have to wait till the next storm to test our ear-o-meter at higher speeds. 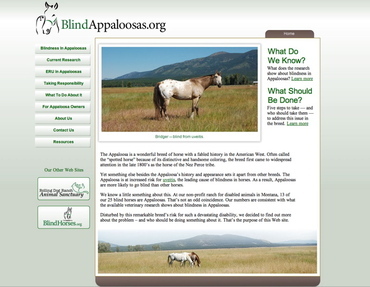 On Monday we're rolling out a new Web site, BlindAppaloosas.org, devoted to the problem of blindness in the Appaloosa horse breed. Appaloosas are much more likely to get uveitis, the leading cause of blindness in horses, and are more likely to go blind as a result. What's the increased risk? One study showed that Appaloosas are eight times more likely to get uveitis and four times more likely to go blind, compared to other horses. This is why, of our 25 blind horses, 13 are Appaloosas. That's no fluke. We used photos of several of our blind Appys to illustrate the new Web site. So we decided to do what we could to focus attention on this very real problem in the breed. This is the first time all the veterinary research on the subject has been brought together in one place. Our view is that the Appaloosa Horse Club, the official breed association, needs to publicly acknowledge the breed's risk for uveitis and blindness -- they never have -- and begin funding research into the genetic links between this affliction and Appaloosas. While the research demonstrates the breed's significantly increased risk, we don't know why Appaloosas are so prone to this disability. And if we don't know why the breed is at such risk, we can't do anything about it. There is a lot of work that needs to be done. One of the things Alayne and I have been wrestling with this past week is a cancer diagnosis in one of our own personal dogs, Shiloh. He was one of the original "Seattle six-pack" that moved out to Montana with us. 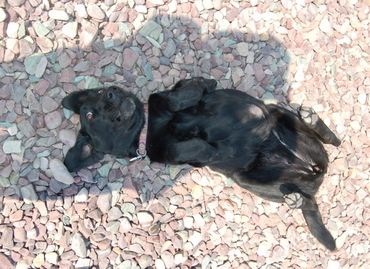 He is also, I am somewhat embarrassed to admit, the only "normal" dog we ever adopted. Shiloh was just an impossibly cute, adorable 12-week old puppy at a Seattle-area shelter where we were volunteering. I fell for him. He came home. Shiloh's now eight years old. Two weeks ago he suddenly became lethargic, wasn't eating, his gums were a bit pale, and he just seemed down. He'd bounce back for a day, then look like he felt poorly again. An ultrasound revealed nodules on his spleen and "free fluid" -- presumably blood -- in the abdomen. Our primary care vet in Helena, Dr. Brenda Culver, told us what she suspected: a blood-borne cancer called a hemangiosarcoma. Hemangiosarcoma is a very aggressive, high-grade soft tissue sarcoma with the most common areas affected being the spleen and heart. A highly malignant cancer which preys on blood vessels, it can spread rapidly, causing tumors almost anywhere in the body. Hemangiosarcoma is insidious, as it attempts to build its own blood vessel network, making blood blister-like formations which disrupt normal organ function. It is commonly in the advanced stage before detection, making it virtually a silent killer. For some very graphic, don't-look-at-these-before-dinner photos of hemangiosarcomas, click here. Brenda operated last week to remove his spleen. She found one nodule had ruptured, spilling the blood into the abdomen. The other nodule was still full of blood. 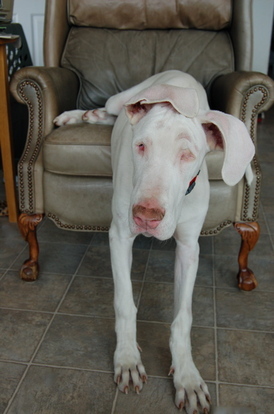 Shiloh did have cancer, and it was hemangiosarcoma. This was truly bad news. Hemangiosaromas are always fatal. 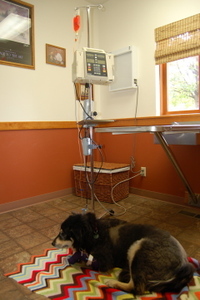 Without chemotherapy, Shiloh would live perhaps three months. With chemo, he may live six to nine months. So today Alayne took Shiloh to Brenda's clinic in Helena for his first chemotherapy treatment using a drug called adriamycin. The drug was slowly dripped into Shiloh via an IV, and the treatment lasted about an hour. Alayne took these photos while Shiloh quietly sat still in the exam room at the clinic with the adriamycin dripping into his veins. Back at the ranch this evening, Shiloh was back to his happy self, although the chemotherapy may slow him down over the next few days. In case you're wondering about his odd-looking haircoat, we had to have Shiloh shaved a couple of months ago because of cheatgrass spurs that had worked their way through his thick coat and into his skin. His hair is now growing back, but not exactly in a uniform fashion, so he's a bit patchy. I don't know if the chemo is going to affect that or not. Shiloh will have the chemo treatments every four weeks for the next four months, and we'll just have to monitor his health and his quality of life as we go. Long-time friends and supporters of the sanctuary, John and Judy S. of Wichita, Kansas, just sent us this photo, along with some others, from their last visit to the ranch. That's blind Patti giving John a kiss ... or maybe telling him a secret ... or both? Our visitor season is now over -- it runs from June through September, and this past Saturday and Sunday was our final "open" weekend for visits. We had folks from Georgia, Idaho, Illinois, New Jersey, Washington and Montana visiting. 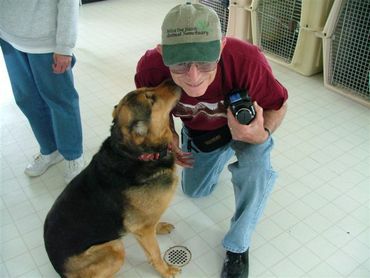 Patti and gang will still get plenty of attention from the rest of us at the ranch and our regular volunteers, of course, but Patti will have to save a kiss for John until next summer! 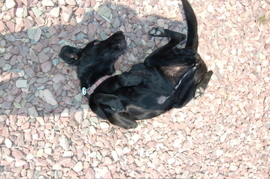 Alayne captured these shots of Birdie rolling around on her back on the landscaping rocks outside our back door. Now, our dogs roll around on their backs in the grass all the time, but these rocks don't seem like they'd be all that comfortable, do they? I mean, what do they have that grass doesn't? Nevertheless, Birdie was rolling away on them, back and forth. It may have been she was just showing off for the camera -- doing whatever she thought would get Alayne's attention. It worked! Birdie -- Bossy Birdie, we call her -- is an attention hog, and whenever we have visitors, she goes crazy when they're on the other side of the fence from her. She has this odd, insistent bark/whine that sounds more like a seal than a dog. I've told her I'm going to teach her how to balance a ball on her nose like a real seal, and then she'd have a true attention-getting trick to show off. But apparently she already thinks she's a roll 'n rock star.